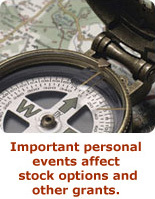 Life Events explores the role stock grants play in the financial planning for a variety of major personal occurrences. Browse an overview of this section below, or explore the subsections to the left. Major topics covered include retirement and retirement plans; paying higher-education costs with stock grants; divorce and its impact; death and the death taxes on your estate; and disability. Stock compensation can help you save for retirement. Understand the issues and explore strategies that can help your retirement funding. Podcast included! When you retire, there may be a gap between your retirement date and the qualifying age for retirement-plan distributions and Social Security. To bridge that gap, stock-based compensation can help, but its complexity can be confusing. This article seeks to help you factor in stock compensation when you sequence cash flows to cover living expenses in retirement. What are the top 10 questions related to retirement planning that I should ask about my stock options, restricted stock/RSUs, or ESPP participation? After my death, at what times might my stock options be taxed? To seek financial aid for children's college tuition, I report income and assets on the Free Application for Federal Student Aid (FAFSA). Should I list my stock grants? At what value? Is my spouse entitled to part of my stock options and other stock grants upon our divorce? What happens to my stock grants if I become temporarily disabled? I retired and moved states. When I exercise my options and my restricted stock vests, will I be taxed by the state where I worked or by my new state?